One of the ports of call for our Royal Caribbean cruiseship during the week of November 28/04 was Ocho Rios, Jamaica. Probably the most famous site in the region is Dunn's River Falls and we chose to tour it on our own rather than through one of the cruiseship tours. Once we disembarked from the cruiseship, there were cabs and shuttlebuses available at the pier. Cabs to Dunn's River Falls were $22 US for a return trip. Cabs allowed 1-3 people per vehicle. We were also told at the pier that small shuttlebuses also go to the Falls at $5.50 US per person. These were also based on return trips. The only problem with shuttlebuses was that we had to wait until they filled up the shuttle before leaving for the Falls so since we were the first on the bus, we had to wait about 15 minutes for it to fill up. The driver then asks you when you want to be picked up at the Falls for the return trip. Our driver suggested 2 hours to see the Falls so we agreed on this time duration. Once at the Falls, a woman then came onboard the shuttle to sell tickets for admission to the site at $10 US per adult person which was the same rate at the park's ticket booth. Once inside the Dunn's facility, there were rentals for special rubber shoes as well as lockers. We carried a small backpack so we didn't require paying for a locker. We also brought along our scuba diving booties so we didn't have to rent those rubber shoes on site either. The cruiseship shop was also selling these rubber shoes in advance. Shoes of some type are highly recommended as the rocks on the Falls can be slippery and some of the bottoms of the water pools are a bit rocky. If you have old sneakers you don't mind getting wet, they will be suitable for the climb up the falls as well. Our scuba diving booties turned out to be sufficient. The entrance to the site is at the top of the falls so we took some stairs that were adjacent to the falls to the bottom where the beach and entrance to the climb were. There are official guides dressed in blue polo shirts and shorts who will take groups up the falls. Normally, they will ask to carry all cameras for you so they can take photos of you as you climb. Of course, they expect to be well tipped for their services. Also, groups were told to hold hands forming a human chain up the falls. This was suppose to make things safer but as we witnessed, this method of going up the falls is not a guarantee against falling. We saw a woman let go and she fell down the rocks during one of the steeper sections. She wasn't badly hurt but we imagined that she sustained some nice bruises. There are various points along the falls where you could get off the falls and back on the stairs to walk up the rest of the way. Not everyone there attempted to climb the falls as many were happy to just walk dry along the side on the stairs. We chose not to go with any of the groups which tend to go up the left side of the falls. We made our way up on our own mostly on the right side. With some breaks for photos, we made it all the way up the falls in about 30 minutes. Going with a group would have taken longer for sure. The water is a bit cool and if you have a wetsuit, it is highly suggested that you wear it for the climb. Cameras used there up the falls are also recommended to be water resistant since they likely will get wet. We left our digital camera on the ship and took one of those $25 underwater cameras. After climbing the falls, we headed back down to the relatively small but uncrowded beach where the ocean water was warmer until it was time to depart. The exit back at the top of the falls was strategically located at the end of a market so we did have to go through some locals who tried to sell us their souveniers. These locals who worked inside the Dunn's site were hustling but not as aggressively as those in the town of Ocho Rios. The shuttlebus arrived at the site parking lot on time as agreed. The total amount we spent including the park admission and the shuttle was $31 US for the two of us. Taking an organized tour through the cruiseship would have cost more than double this amount. 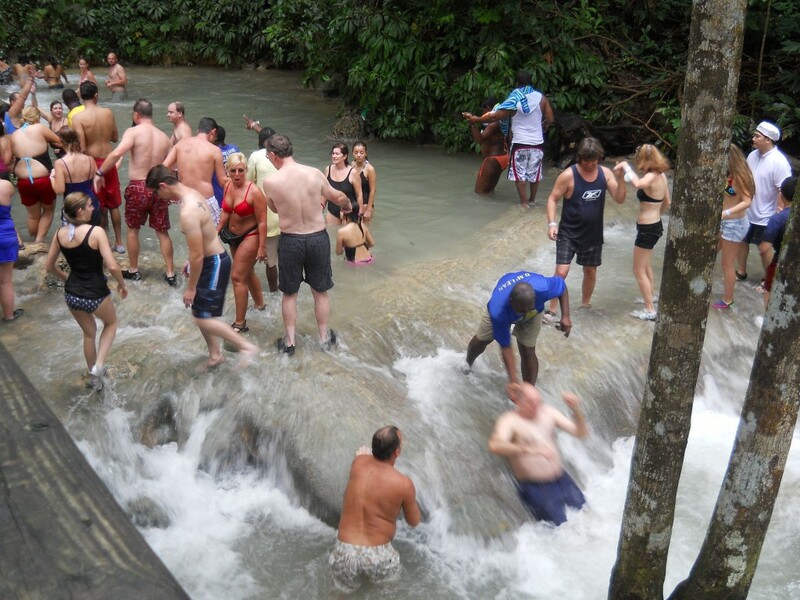 So it is quite possible to tour Dunn's River Falls on your own rather than take the more expensive tours. We were glad that we did see Dunn's River Falls but we thought that it was not nearly as impressive as depicted on photos in travel brochures.